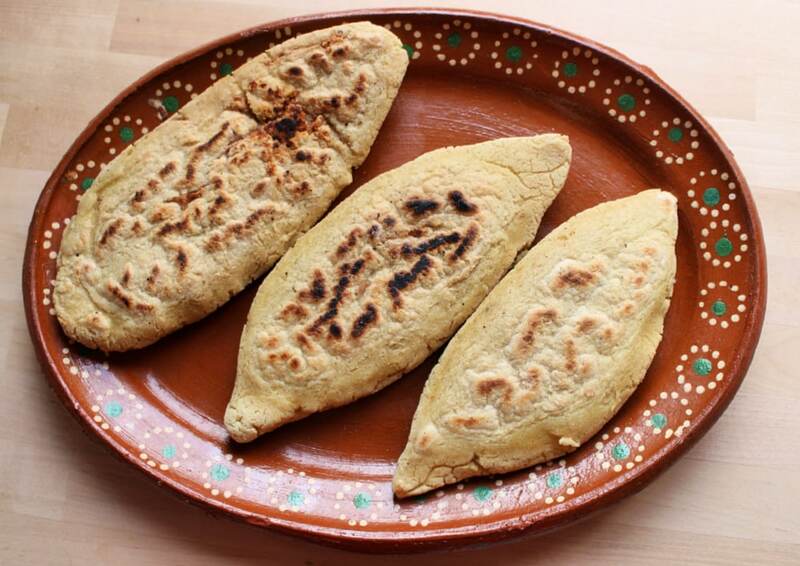 Tlacoyos are oval-shaped corn masa creations usually stuffed with refried beans. 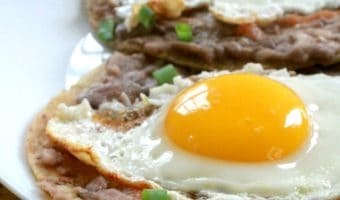 Delicious Mexican street food that you can easily make at home. Watch the video or check out the step-by-step pictures below. There is a little old lady by my dad’s house in Mexico that is known for her quesadillas and her tlacoyos. She wakes up very early in the morning to make the masa and sells these tasty bites only on certain days. The people in the neighborhood already know what days to go and line up for her incredible goodies. As with most food stands in Mexico, if you get their after she runs out, you’re out of luck. Tlacoyos are made with very few ingredients – masa harina, warm water, and salt. Then they are stuffed with refried beans. 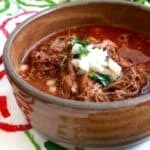 Such an easy Mexican recipe, but there’s a trick to it. 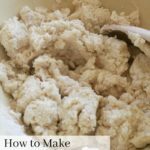 Start by adding the masa harina to a large bowl. You need a bowl that’s big enough to mix everything. Add salt. 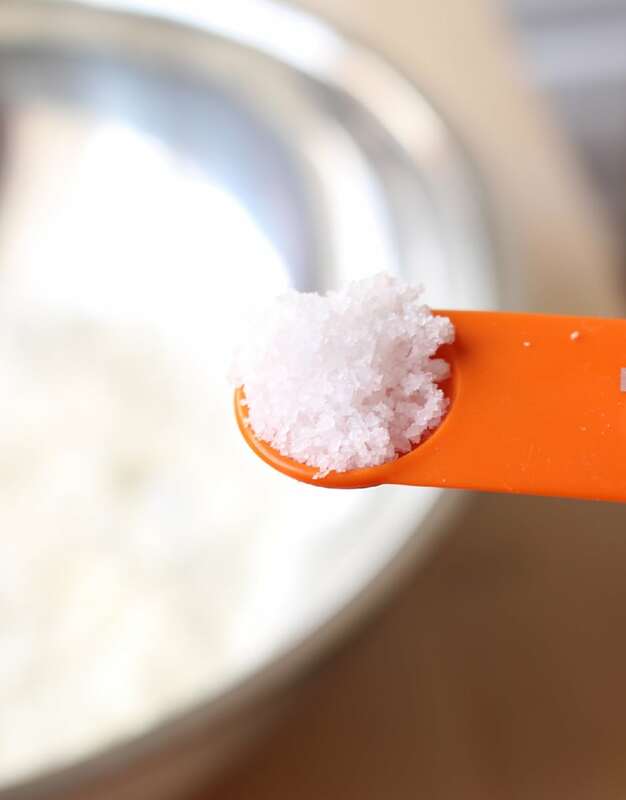 I tend to undersalt things because I always feel like you can easily add more salt if you need to. Just like it’s hard to un-boil an egg, it’s also as hard to un-salt food. Warm water is needed. You are mixing by hand, and you don’t want to burn yourself. Only a few seconds in the microwave is all you need. I warmed up the water in the microwave for 15 seconds, and the water temperature was perfect. Mix well. You want the consistency to be like wet sand. It’s beachy keen! Taste it. I know it sounds weird, but this is your opportunity to taste for salt. If it needs some salt, add salt and then mix some more. 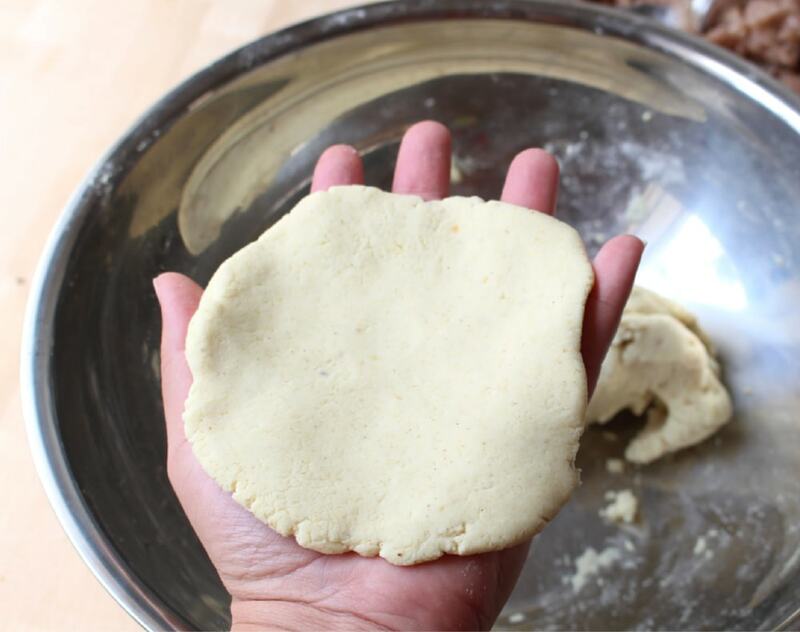 Form a ball with the masa dough. Do you see the size in the picture above? It is the size of a tennis ball. Game. Set. Match. From here, pat it just like a gordita. This ain’t patty cake, and I ain’t no baker’s man. Don’t make it too thin. It will look like a thick tortilla and can cover your hand. 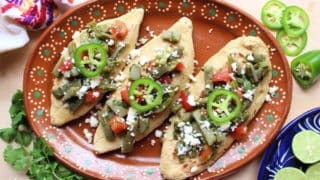 Tlacoyos is a great recipe to use up leftover beans. Add about a tablespoon of creamy and yummy refried beans to the center of the masa. You can also use black beans if you like. Bean there. Done that. Fold over the ends to seal up the masa. Sealed for your protection… and theirs! You don’t want them to escape. CIA Kitchen Edition. 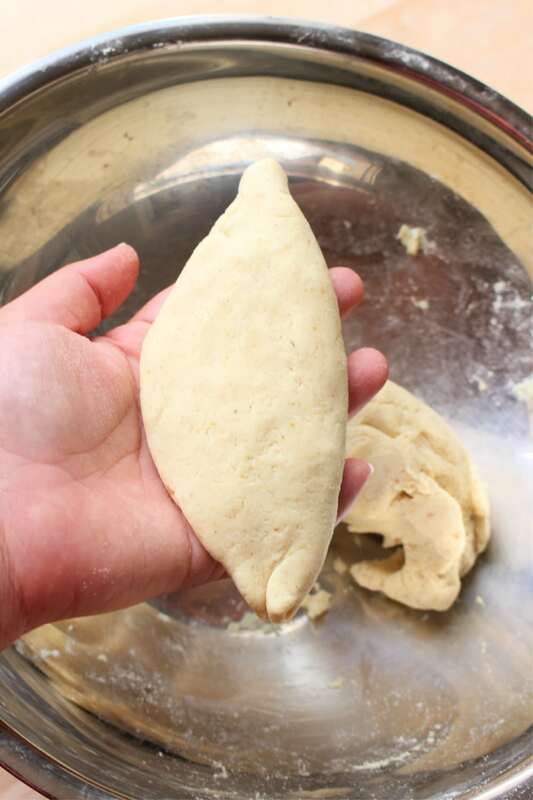 At first, it will look almost like an empanada, the shape of a taco. However, your goal (post) is to make this into the shape of a football. Welcome to the NFL, the National Frijoles League. Carefully, start to pat it and form it. Be very gentle with this or the beans will come out. If the beans come out, cover it with some more masa. Get some water. Dip your finger in the water and press the masa area to close up the hole. If it’s a small opening, it’s ok. The tlacoyos will cook just the same. 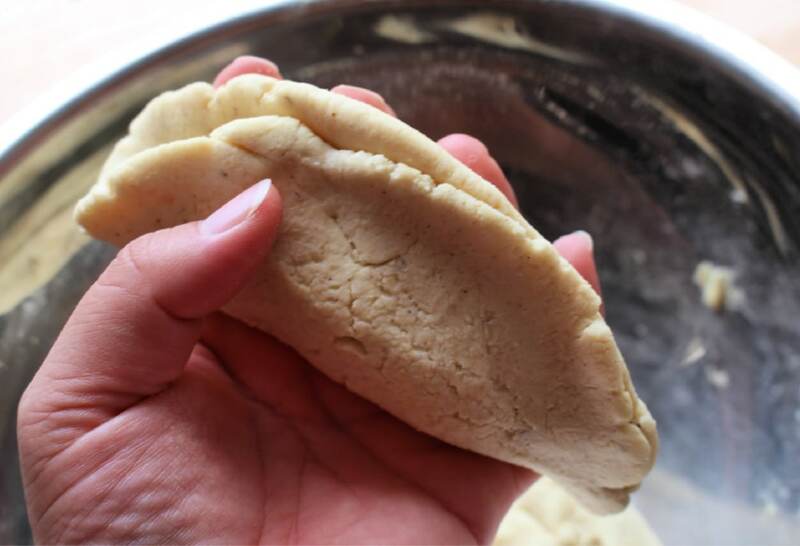 You want to form an oval shaped masa. Think of a football with two pointy ends minus the tackling and punting. Heat up the griddle or skillet. 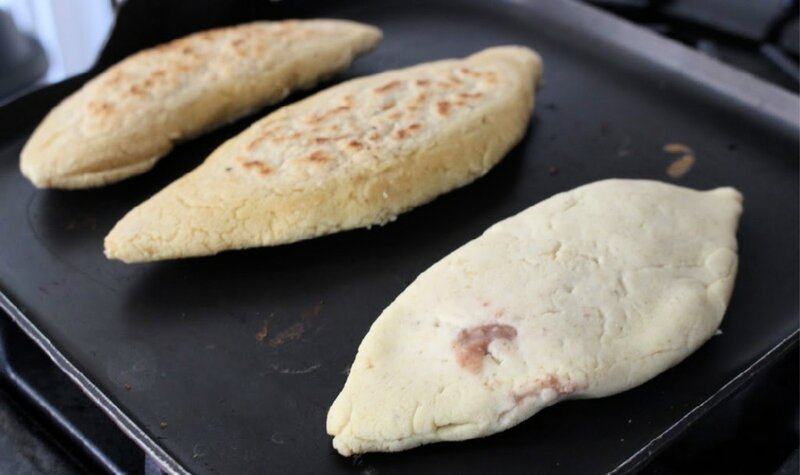 Place the tlacoyos on the hot griddle and cook for 5-7 minutes on each side. Touch the tlacoyos to make sure they are firm and fully cooked. There are people who fry their Tlacoyos. They are amazingly good! It elevates them to a whole new level. The way I’m making them on the griddle takes longer than if you fry them. I like my tlacoyos slightly burned. I will leave them on the griddle for up to 10 minutes before turning to get those burned spots. Yum! The toppings for tlacoyos vary. You can add chorizo con papas, Mexican picadillo, or as I’m adding here, ensalada de nopales. My brother is a vegan, and I’m not much of meat eater. 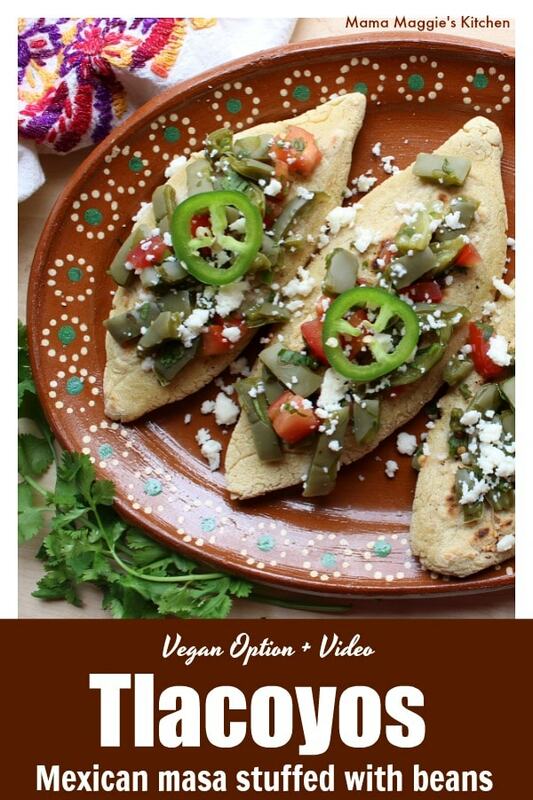 If you take out the queso fresco, these tlacoyos are completely vegan. 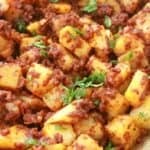 Hope you enjoy this simple but delicious Mexican recipe. 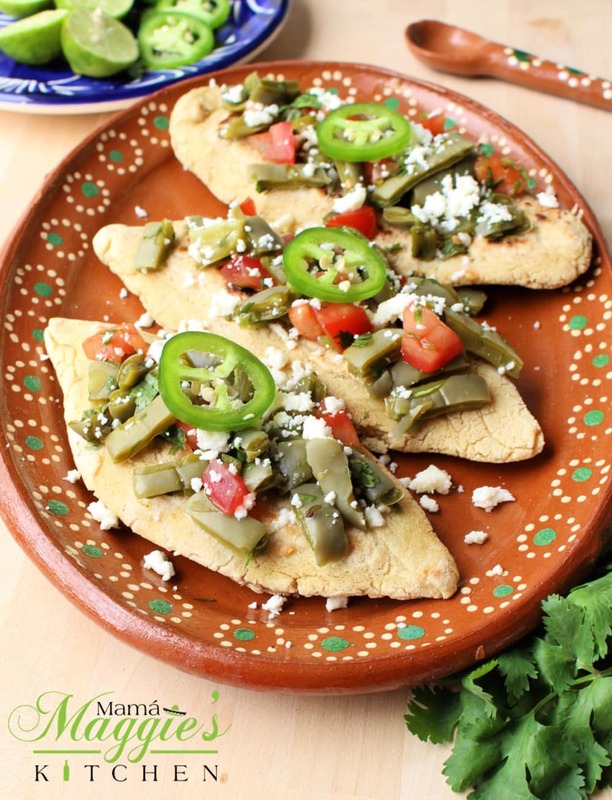 Tlacoyos are oval-shaped corn masa creations usually stuffed with refried beans. Delicious Mexican street food that you can easily make at home. 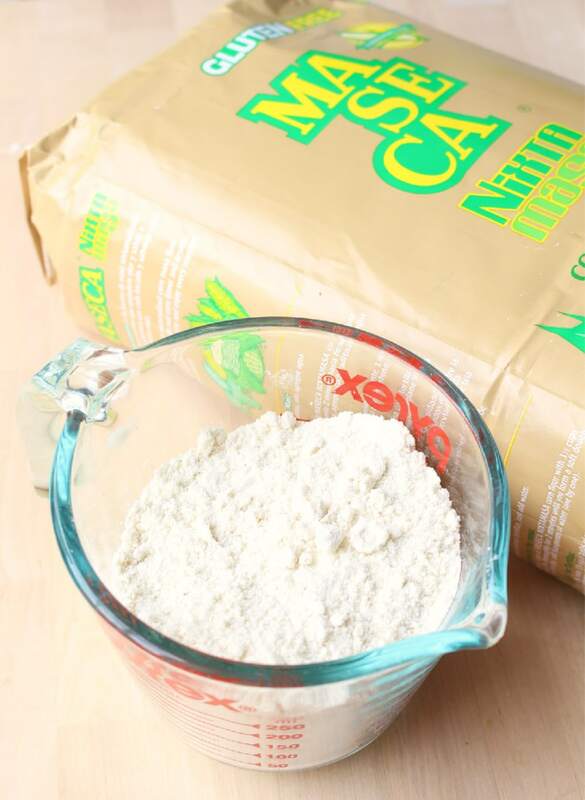 In a large bowl, combine the masa harina and the salt. 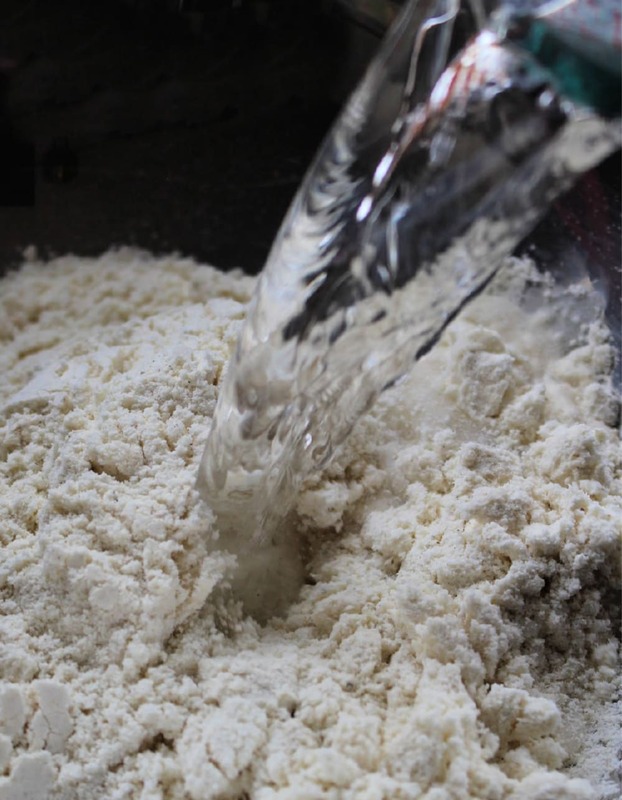 Gradually mix the dry ingredients with the water until it forms a large masa dough. It will look like wet sand. 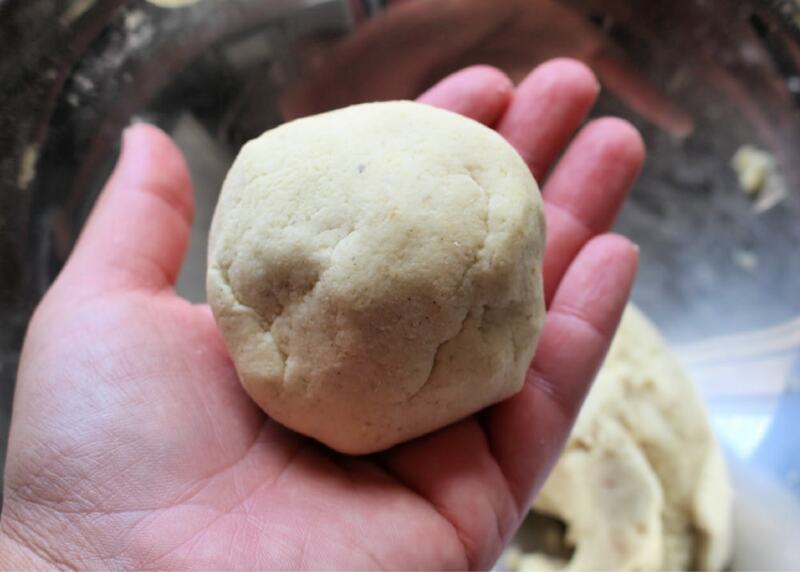 With wet hands, make a ball of dough. About the size of a tennis ball. 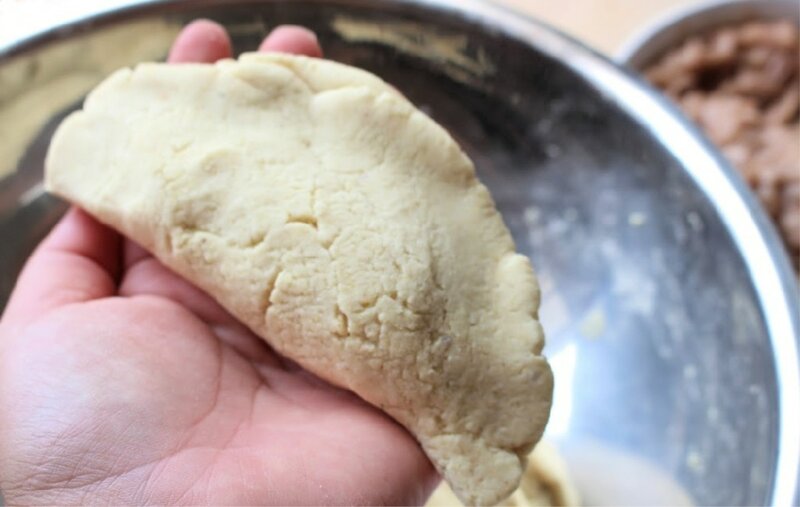 Pat out the dough. It should cover your hand and look like a thick tortilla. 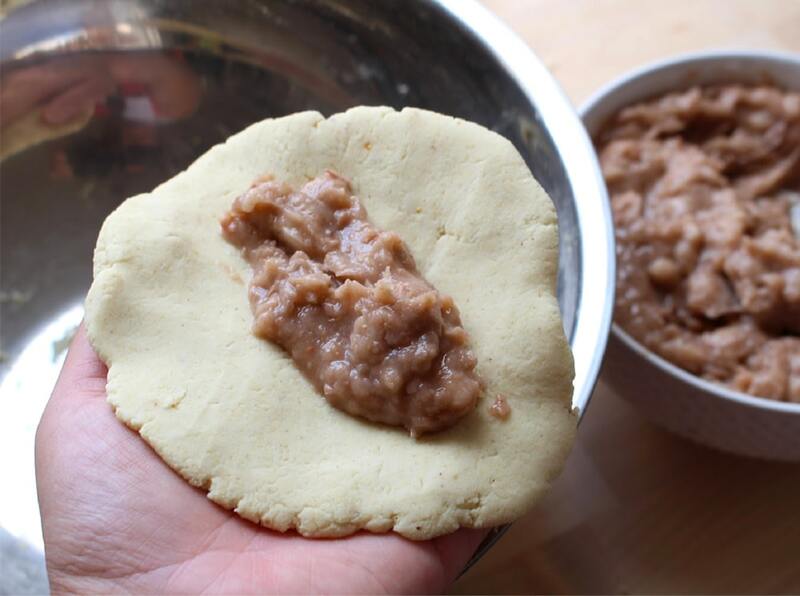 Add 1 tablespoon of refried beans to the center of the masa in your hand. Fold over the ends to seal up the masa. It will look like a taco or empanada. Be careful not to squeeze or push out any beans. Slowly start to flatten the masa out until it resembles a long, pointy football. Place the tlacoyos on the griddle. If distracted, cover the masa with a kitchen towel. 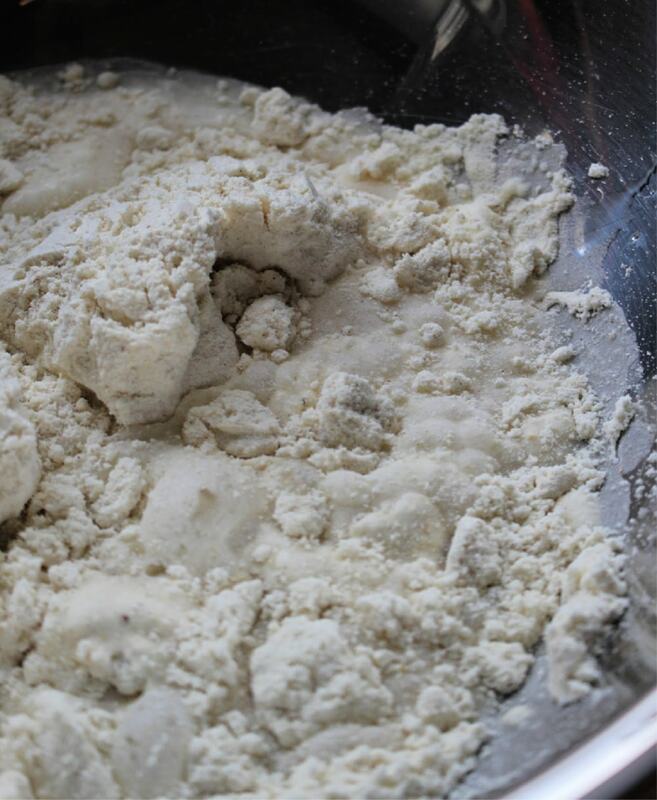 You don’t want to dry out the masa. Oh this looks amazing! I love finding new recipes to try out. My family likes trying new dishes and expanding out pallet, plus I am a sucker for tacos and Mexican food in general. lol. I’m a sucker for Mexican food too. Tlacoyos is very traditional Mexican food. They aren’t hard to make either. If you can get your hands on Masa harina, you’re good to go. I have never heard of those before but, they look so tasty. I definitely need to make these Tlacoyos. 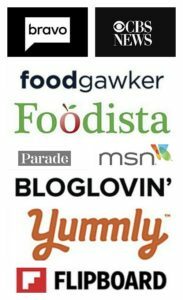 I pinned your recipe so I can make them. I can’t wait ..yum! I knew very few people would know what they are outside of Mexico. 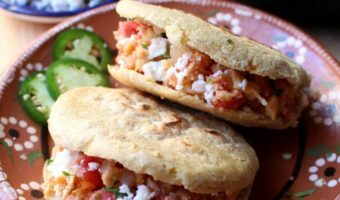 Sometimes, you’ll see tlacoyos on street corner or served as an appetizer. Sooo good! This is something new to me. Looks amazingly delicious. It’s a very, very traditional Mexican recipe. Tlacoyos are kind of like really thick corn tortillas. Delicious! I have yet to find a good recipe for Tlacoyos. I have to try this out and surprise my family this weekend! Sounds great. 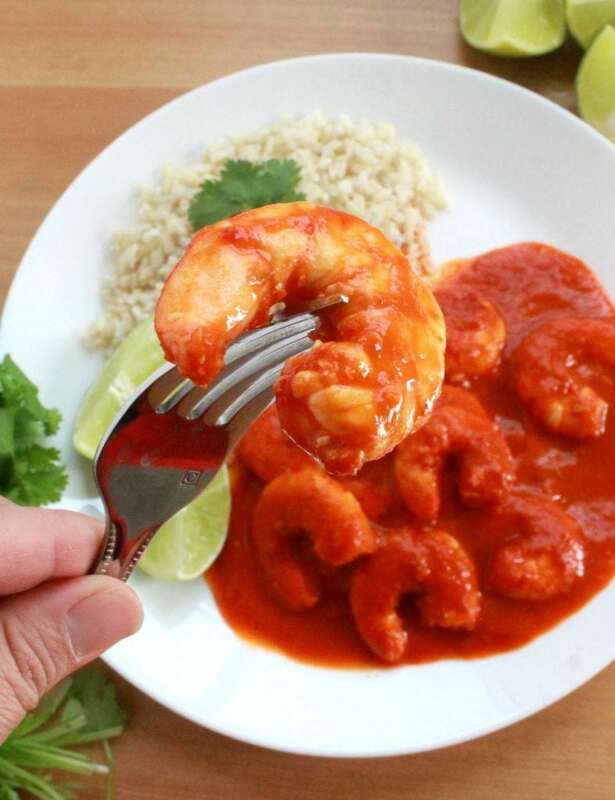 I hope you and your family enjoy my tlacoyos recipe. Oh wow that looks so delicious! Yummy! Thank you. Tlacoyos are delicious! These look absolutely amazing ! I am definitely going to try to make these. Hope you do. 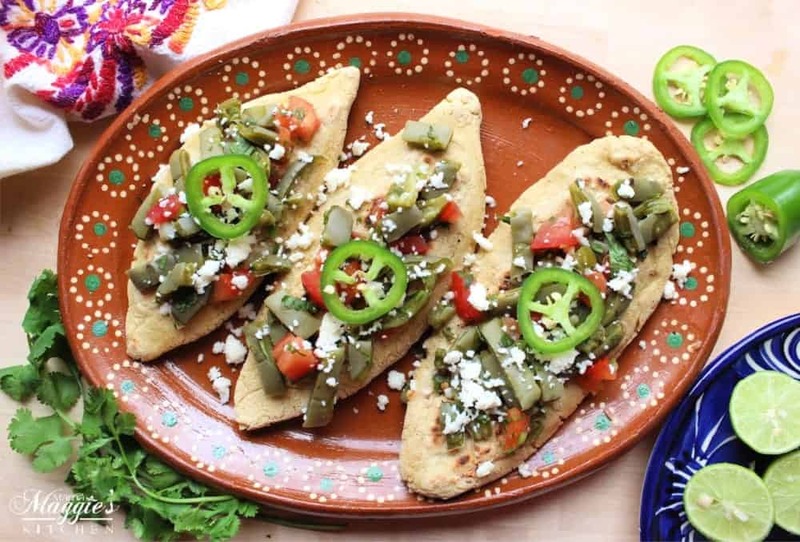 Tlacoyos are very easy, delicious, and very Mexican.